Oh, I’ve done it; you’ve done it – admit it. All the people I’ve come across at one time have done it. Somewhere in your journey of life you came up short, despaired that you never excelled at that one thing that you enjoy or admire or maybe you did go after that dream or you didn’t break through to achieve eminence, fame, prosperity – whatever term fits the talent or industry to the road you didn’t take. With the Olympics upon us, the questions may center on physical success. 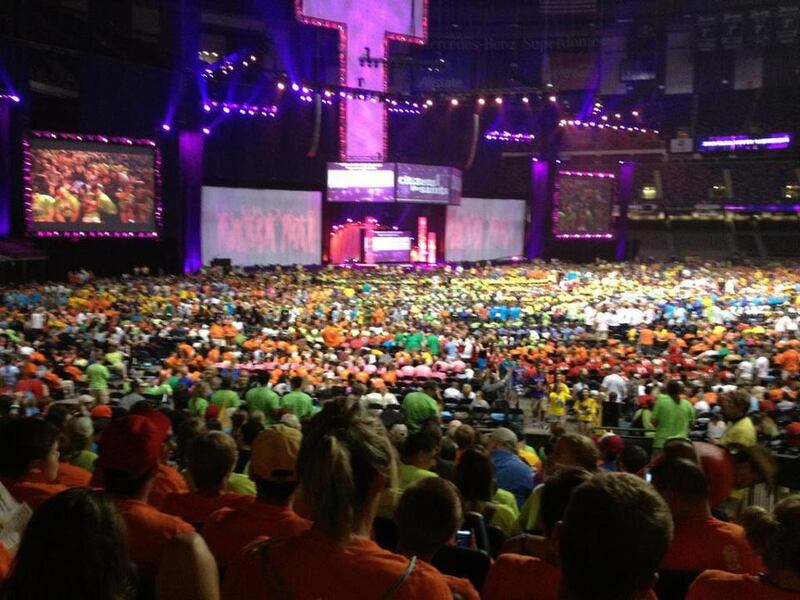 What of the many athletes who spend “their best years” trying out and not making the team? Or never gaining the sponsorships needed to just devote every waking second to come up to the quality needed to be on the world stage? Chances are, you’ve wondered, “Why didn’t it all come together for me?” Have you dared to ask aloud and heard the responses? Let’s hum together. The airwaves are full of songs that exalt this theme: “You Can’t Always Get What You Want” (Rolling Stones), “You Got a Fast Car” (Tracy Chapman), “Glory Days” (Bruce Springsteen) and “Still Haven’t Found What I’m Looking For” (U-2). 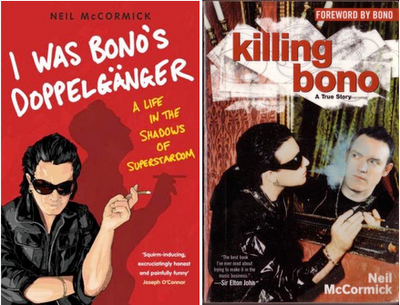 Killing Bono: I was Bono’s Doppelganger by Neil McCormick is an autobiographical book based on the author’s efforts to break into pop music as the front man of several bands simultaneous to Bono and U-2’s ramp up to fame in the 1980s and ‘90s. McCormick details his unbridled passion for music, living on the brink of poverty in order to live the life, rehearse, perform, lay day demo tracks, get music into the hands of agents and recording companies all while schoolmates Paul Hewson (Bono), David Evans (The Edge), Adam Clayton and Larry Mullen Jr., became international rock stars. McCormick’s treatise on fame, envy, insanity is at times painful and other times laugh-out-loud funny because of his downright honest take on his all-in lust for making it. McCormick and brother Ivan’s bands included Frankie Corpse and the Undertakers, The Modulators, Yeah, Yeah!, and Shook Up! Frustratingly, he and his band mates falter because of bad luck or are always one step ahead or behind the industry. One mucky-muck insisted that it was Neil’s haircut that was hindering success. The book’s consistent theme centers on our constant compulsion to compare ourselves to others – a seductive, yet destructive way to live. It doesn’t help that frequently Neil and Ivan cross paths with the U-2 gang and the futileness of their musical mission is palpable. Like a bear getting stung while licking trace honey from the beehive, repeatedly stung, but going back for more, McCormick takes any glimmers of faint praise to fuel his blind sojourn into pop music. Ultimately, the on-and-off day job that helped pay for this hobby – writing – brought him recognition, fame, a lifestyle that still allows him to dabble in music. Today he is the London Telegraph’s chief rock and pop music critic. He seems to revel in his life of rubbing shoulders with musicians and writing about music from a knowledgeable point of view. Is he satisfied? Not quite. 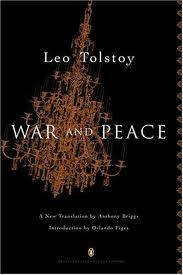 But he seems to have reconciled himself to a life that places him achingly close to that dream. So many of us struggle with the tension between what we’re drawn to and what we’re good at that reading this book is a refreshing peek into a life of chasing dreams and then finding new ones that position us where our true talents lie. 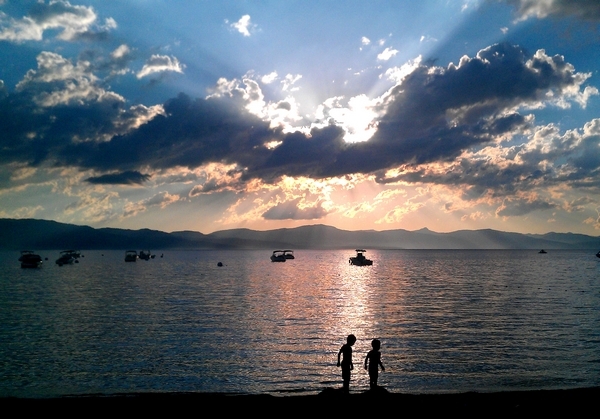 July sun sets at Zephyr Cove, Lake Tahoe. In my happy place, the one I come back to again and again to refresh my spirit, I am closer here – Zephyr Cove, Nevada – to true self, centered on what is good, what is beautiful, what is joyful and what is pure. All at once, like a child again, I frolic on this beach at Lake Tahoe, drawing in the scent of pine after the cleansing rain downpour earlier today. Ambrosia. The summer rain has calmed the surf, coaxing clear waters to reflect the brilliant sky above while the Sierra range itself acts as arbiter between heaven and earth. By sunset, the mountain peaks take shades of amaranthine, plum, cerulean and dun, the edges softened by the setting sun. My heightened appreciation for the panoramic scenery this past week is due to finishing John Muir’s “The Mountains of California,” the first of his fourteen books (some published posthumously) devoted to the picturesque Sierra Nevada Mountain range. 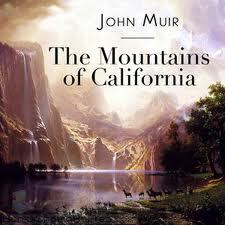 Muir’s prose reflects his love and commitment to nature. A scientist by training, a naturalist in spirit and a writer prompted by the dire need for conservation, Muir emulated Emerson and Thoreau in style. But only his eye-witness to California and Nevada’s majestic treasure – the Sierra range – could inspire the voices of preservation that became the Sierra Club and gave birth to the national parks system. My “Happy Place” is now irrevocably married in my mind with Muir’s prose that reflects our deep and abiding love of this western panorama. So ran my thoughts this week while browsing the aisles at Zephyr Books, a nearby used book store in Reno, Nevada. I have no ax to bear against any new book-seller – be it a large store with the newest best-sellers or a small independent bookstore with its ability to tap into the local readers’ interests. But I am so grateful that this third platform exists – that of the used book merchant whose stock and trade is providing an avenue into vintage books – still good, still reliable, still pertinent – but perhaps the publisher no longer stocks or prints those books or the books don’t enjoy the 2012 critics circle awards or a big push by literary publicists. The Barnes and Nobles of the world have limited space and want to market to the masses – what was hot two years ago, needs to go, go go to make room for the latest celebrity exercise craze or Part #215 of Janet Evanovich’s Plum series. In weaving the aisles of Zephyr’s organized shelves I marveled the copious categories of books and felt reassured that these volumes have a loving temporary home organized and upright in rough alpha order rather being put in someone’s shed or being thrown in a landfill. For these authors – every one of them – still have a story to tell or information to impart beyond the suggested “Buy Before” or presumed “Best-by” date that is arbitrarily assigned by the New-to-You stores. Not bound to be classics, like Jane Eyre or Catcher in the Rye, the books here are the magnum opus of another order – the literary Rembrandts of the 1990s or the niche books about geography or painting or Chinese politics that just never hit the stock shelves of the Wal-Mart that are well researched, polished and ready for your — and my — bookshelves. The staff is friendly and willing to chat it up with you and they have a fun coffee bar to boot. My Saturday sojourn companion was daughter Marjorie – 12 years old and brimming with Book Love/Lust – just like her Mama. Her quest was to gather books for a “new” bookshelf (more on that later) in one of six genres. “I need a book on Russia, Mom, or something from the 1920s” – such is her eclectic quest for knowledge. 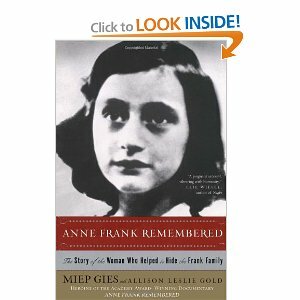 We walked out with a WWII book, a mystery and a realistic fiction. But before our spree was over, we spotted three special books nestled in the Nevada section authored by my dad – her granddad. Yes, of course we have them at home, treasured for all time, but to see dad’s tomes displayed knowing that they are waiting for a special owner to purchase them, read and cherish them, did my heart good. 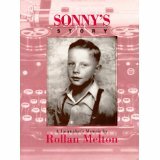 A professional journalist, Dad had wonderful stories to share: “Sonny Boy” is an autobiography; “Nevadans” and “101 Nevada Columns” are a “Best Of” selection of his columns from the Reno Gazette-Journal where he (Rollan Melton) wrote from 1984 to 2002. His books never made national headlines or garnered reviews in the Times, but he imparted good news about our neighbors, neighborhoods and our state. Without this used book outlet – this dealer in our yesterday texts — Rollie’s fundamental stories and talents would be relegated to a pulp mill. With it, readers and writers can find a new friend. 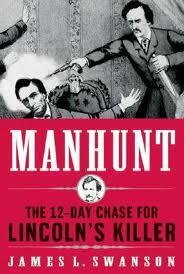 “John Wilkes Booth is dead,” I announced. Manhunt by James L. Swanson IS a page-turner and a thriller proving that when a deft writer takes on a chapter in history, researches the subject, the characters, the mood of the nation, the region and scenes where the events took place and then guides his reader through this window into the past so adeptly, we can step into his time machine with him and not only understand, but thirst for more. Now that I had Madeleine’s attention (the 15-year-old) we had a good laugh and talked about the realizations I had come to after reading the book and how I had forgotten the true circumstances of Booth’s run from Union forces and his ultimate discovery. Through my enthusiasm for the topic, her inquiries increased and our morning drive flew by. Books have always been a connecting influence in our family. That’s bound to happen when the DNA on both sides of the family have readers, writers and editors, but mostly it’s the stories we share – oral or written – that bind us together as family and give our own family a shared history and shared passion for story-telling. I’m so glad that we have that “thing.” For some families it’s music or math, for others politics or practical jokes, still others can talk sports or the outdoors, while others focus on religion or medicine, or maybe it’s hunting or gardening – You get the picture. Sadly, some families don’t have that “thing.” That thread that can be picked up each time members re-unite. They can only talk about the weather or the Kardashians. And I’m glad our touchstone encompasses of stories and books because they are a source of comfort, of meditation, of escape, of learning, and of laughter. AND favorite books and stories can be passed through the generations for their very own time travel machine.